JEGS rotationally-molded Race Seats are constructed from high-density polyethylene to ensure the highest quality double-walled shell for excellent back, lumbar, and side support. JEGS Vinyl Seat Covers are sold separately or as part of a kit with seat, mount, and sliders. 70200 is rated 4.7 out of 5 by 21. 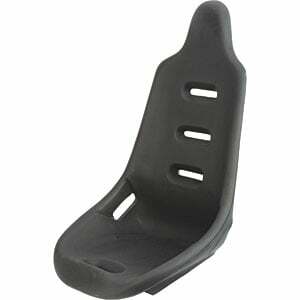 Rated 5 out of 5 by Pkf70 from jegster poly seats I bought 2 of these for my race car. Very well made seats, liked that their were 6 threaded bungs for mounting them in your car. These seats a very comfortable even for us big guys. Only thing is they sit up higher, and they wouldn’t work in my car. I needed basically seats that were flat bottom, and mounted to the floor. Overall they are nice seats, just didn’t work for my application. Rated 5 out of 5 by jordantmiller from issa $39 seat I received my two seats pretty beat up from transit and at first was a little bummed till I remembered I only paid $39 bucks for them. From the way the urethane is poured the mounting points are a little bent and some of the edges need sanding but as is these truly are a great bang for the buck. After a seat cover these beauties with be perfect. Rated 5 out of 5 by Aspenkid from Excellent Good quality and fast ship. Recommend to anyone even enemies. Rated 5 out of 5 by cjj1 from decent seat for the price My son and I are building a go kart and this seat works well. The design keeps you firmly in the seat during quick turns and is reasonably comfortable too. Rated 5 out of 5 by Fever1320 from Great product I bought this seat great product and easy install. What is the thread pitch of the nuts on the bottom? These will be 3/8&quot;-18 bolts. Will this seat fit my kids go cart? You will need to check the dimensions listed on the web page. Is it compatible with 3-point harness? Yes, it can be used with most 3 point harnesses. Is there a slider mount that is made for this seat? Do you have a picture of the bottom of the seat? On the overview tab on the web page you can see a diagram of the bottom of this seat. Do I need new seat mounts? Or can I use the seat mounts already in my car? This seat is not FIA approved.